Last week I spoke with Joshua Tauberer for an upcoming interview about his project, GovTrack.us, which is one of several efforts to make official sources of information about Congressional legislation available in more useful and actionable ways. Sununu supported a tax credit on high-efficiency biomass fuel systems, including wood-pellet stoves. The Senate passed the measure in April, in effect encouraging people to use the appliances, just as those who take on solar or wind power receive financial incentives for doing so. I’ve invested rather heavily in clean wood-burning technologies — first in a pellet stove, now also in a wood gasification boiler — and I’m hoping these investments will qualify for tax credits. When phone calls to the local offices of my state representatives produced no results, I resolved to research the matter myself. Here were my questions, along with the answers I found. Q: Which bill approved by the Senate in April contains these incentives? Q: Which appliances will qualify? (F) a stove which uses the burning of biomass fuel to heat a dwelling unit located in the United States and used as a residence by the taxpayer, or to heat water for use in such a dwelling unit, and which has a thermal efficiency rating of at least 75 percent. On that basis I believe that both of my appliances should qualify. Q: What is the status of that legislation? differences in the versions of the bill each chamber approved. The bill then goes to the President before becoming law. Cool! That’s what I needed to know. It ain’t law yet, but it might be. And thanks to a bevy of Web 2.0 tools and services, it was easy to find that out, right? Wrong. It took me three hours on Sunday morning to sort this out. Along the way, I uncovered information that challenges the premise of the newspaper story. Entitled “Sununu touts alternative energy”, the story supports NH Senator John Sununu’s own claim to be a champion of long-term energy policy. 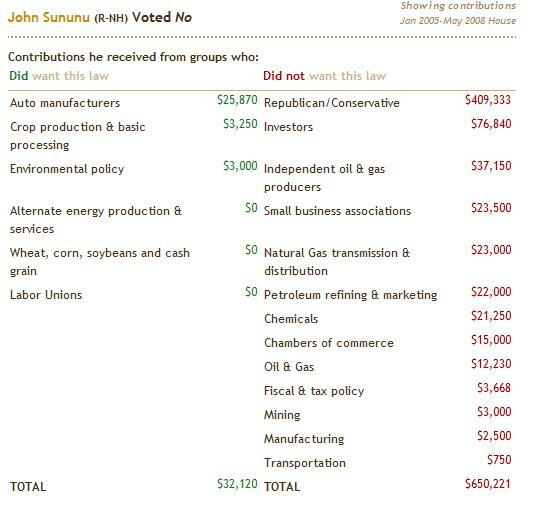 Sununu (and Gregg) were two of the votes responsible for the failure, by one vote, to include a $22 billion energy tax package in the Energy Independence and Security Act of 2007. Weirdly, that rejected tax package included Sununu’s original pellet stove provision from S1697! So while the act became Public Law 110-140 in December, $22 billion of renewable energy incentives were jettisoned from it by Sununu. Why? The Congressional Quarterly noted that it “would have been offset in part by stripping about $13 billion in tax breaks from the oil and gas industry,” suggesting that Sununu was influenced by those interests. It’s utterly amazing, and deeply hopeful, that an ordinary citizen with no prior experience with an issue can dive in and do this kind of analysis. And yet…I’m not really an ordinary citizen. It’s true that I’ve never before attempted this kind of detailed analysis. But I have an unusual degree of skill and perseverence when it comes to searching the Net, finding and using a variety of services, and correlating information from a variety of sources. At one point, trying to pull it all together, I had two dozen browser tabs open. That’s not normal. It’ll take a few more turns of the crank before this kind of thing becomes routine enough for a truly ordinary citizen who cares about some issue to do the same kind of analysis. On the first turn of the crank, we’ll need to get to the point where a Net-savvy individual can do what I did in minutes not hours. On the second turn of the crank, we’ll need to deliver that capability into the hands of folks who aren’t freakishly Net-savvy. I really believe that’s possible, maybe even inevitable. But challenges remain. The Senate passed the measure in April, in effect encouraging people to use the appliances, just as those who take on solar or wind power receive financial incentives for doing so. It took me hours to unravel that statement. For starters, it would help if newspapers would cite the legislation they mention. But that’s only a start. In this case, as is typical, the Sununu pellet stove provision began its life in one Senate energy bill that died, migrated into another Senate energy bill that died, and eventually wound up as part of a housing bill that passed. Separately, the provision was included in, then struck from, yet another energy bill that passed. Crowdsourcing will be part of the answer. But to empower the crowds, we’re going to need power tools that help us visualize how specific bits of legislative language flow through the bewildering thicket of bills, to tie those bits of language to their sponsors, and to relate them to journalistic/blogospheric commentary. Happily, this is just the sort of problem that should appeal to software engineers. The management of source code, like the management of legislation, is a high-stakes game. And in the software realm, we play that game really well. We take for granted the ability to reliably track changes in a large and evolving corpus of interrelated texts. When that same expertise is applied in the legislative realm, the results could be dramatic. On a related note, I enjoyed this snippet from a Wired interview with Martin Wattenberg, whom I also interviewed here. Why is a numbers guy like you so interested in large textual data sets? Language is one of the best data-compression mechanisms we have. The information contained in literature, or even email, encodes our identity as human beings. The entire literary canon may be smaller than what comes out of particle accelerators or models of the human brain, but the meaning coded into words can’t be measured in bytes. It’s deeply compressed. Twelve words from Voltaire can hold a lifetime of experience. Similarly, snippets of legislation can be the tickets to a more participatory democracy — if we can unravel and expose the contexts surrounding those snippets. It should be doable. Author Jon UdellPosted on 22 Jul 2008 22 Jul 2008 Categories . Great post, Jon. I really enjoy these sorts of posts. As you note, there’s amazing power in the ability to use new sites and services to enable things like increased involvement in the democratic process…but even now, it takes something beyond a “regular person” to make the right connections. Both sides need to meet in the middle, but it’s instructive to show what the payoff is. Someone should really incorporate this idea into a policy prescription, or a set of policies, to make government more accessible and efficient. That’s great. Of course transparency means a lot of things, and we need to start nailing down those meanings more precisely, not only in terms of broad policy, but in terms of specific capabilities that enable citizens to engage in effective ways. Those are good recommendations, thanks for the pointer. Here’s a trick that you may or may not know. Call the Senator’s office. And don’t just talk to the person who answers the phone. They are motivated to take your comment and end the call. Find the staffer who specializes in the policy area. Get their name. Get their email address. Contact him or her directly. They’ll know, and be able to answer the content and procedure questions if you ask nicely and intelligently. Once you find the information, posting to your blog, hyperlocal news outfit, or political group blog will spread the information and increase the social context about the sausagemaking process. The net enables new tools, but it also makes this sort of older technique informative for more people. > informative for more people. That’s a great point Adina, thanks! I agree with you about low-tech/here-now techniques.